The thinnest sheets, commonly referred to as tungsten foils, can be as thin as 0.001 inches. More substantial sheets are available in thicknesses up to 5 inches. Tungsten is a hard, heavy and rare metal found naturally in the earth’s crust. It was first identified as an element in 1781 and later as a metal in 1783. Mined tungsten ore is ground into a fine powder, at which point it is considered pure tungsten metal. The powder is typically molded into a bar shape, which can then be cold or hot-rolled into flat sheets, i.e. tungsten sheets. This production process also involves annealing, which is the heating and cooling process that strengthens the tungsten by removing any internal stresses. This process is done by a vacuum annealing furnace. Further equipment used when processing tungsten for tungsten sheets include the following: a four-high cold mill, a straightener, hydraulic plate shears, a water jet, a wire cutting machine and a flat-stone mill. Tungsten sheets can have a variety of finishes, but the metal commonly has a similar appearance to that of steel. 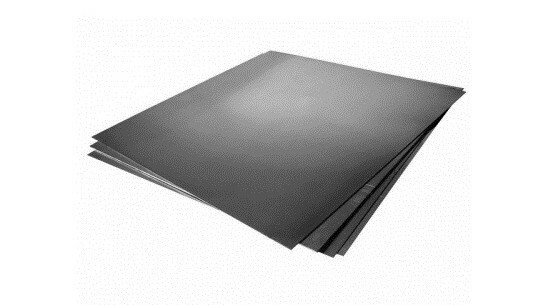 Tungsten Sheets A tungsten sheet is a flattened form of tungsten metal, which may either be rolled or coiled for easy transport and handling. Tungsten sheets are offered in a variety of thicknesses and widths.